Receive written permission from district personnel. Once a student has completed his or her registration, the portal determines whether the student is authorized to take the test. The student cannot schedule the test unless he or she already has an authorization record in the database. The call center may change any demographic information in Credential Manager with the exception of name changes. Only GEDTS can complete name changes. Name change requests need to be sent to gedtechnologyoperations@gedtestingservice.com. As noted in the “Accommodations” section, students need to request accommodations from GED Testing Service® through the GED portal. The Pearson VUE ADA program coordinator schedules appointments with accommodations and makes the necessary arrangements. Account Creation: After the student creates an account, the student receives a message on myged.com confirming the account creation. Registration Confirmation: After the student completes the registration questions, the student receives a message on myged.com confirming the registration is complete. Exceptions: If a student’s registration requires verification from the jurisdiction prior to being approved for testing, the student receives an Exception Letter explaining what additional information is needed and directions on contacting his or her jurisdiction. Accommodations (also considered an exception): An accommodations letter indicates whether accommodations are approved. If so, the student must verify the approved accommodations by calling the GEDTS accommodations team and then schedule an appointment by speaking with the Pearson VUE ADA program coordinator. Under Age of 18: Individuals shall be at least 16 years of age and not currently enrolled in an accredited high school, including those accredited by regional accrediting bodies and also those approved by the jurisdiction’s department or ministry of education. 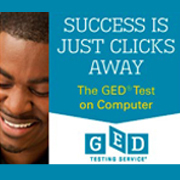 Under no circumstances may the GED® test be administered to persons less than 16 years of age. Accommodations: See the “Accommodations” section later in this document. Options Program (applicable within U.S. & Canada ONLY): Approved jurisdictions can offer the GED® test for alternative education providers and selected school districts for secondary students 16 and 17 years of age, who are still enrolled in these programs. Instruction Required (applicable within U.S. & Canada ONLY): Jurisdictions may require students to take Adult Basic Education (ABE) classes prior to taking the GED® test. Official Practice Test (applicable within U.S. & Canada ONLY): For 2014 exams, the GED Ready™ is the official GED® practice test. Jurisdictions may require students to take these practice tests to provide predictive validity with regard to a person’s readiness to pass the GED® test. Only the jurisdictions are allowed to approve exceptions. The exceptions process is completed through the jurisdiction. A list of locations and contact information is provided on the GED website (GED Manager is the name of the Affiliate Tool. ged.com/gedmanager). If a student has a question regarding the exceptions process or has applied for an exception that has not yet been approved, direct the student to contact his or her jurisdiction. The student cannot schedule an exam at a test center unless he or she already has an authorization record in the database. Authorizations are specific to each module for the 2014 series. All payments for test fees are handled through Pearson VUE at the time of scheduling. Prices are in USD only. A student has the following options for payment of the test: credit card and voucher. A debit card is also an option within the U.S. or Canada only. Students need to request accommodations from www.myged.com as noted in the “Accommodations” section. GED Testing Service students must reschedule and cancel test appointments at least 24 hours before the appointment via the student website, call center, or the test center. Appointments must be rescheduled within the authorized test delivery period. If a student is within 24 hours of their scheduled appointment, they can either take the test or not take the test. If he or she does not take the test, it will be treated as a no-show. Students who attempt to reschedule or cancel their appointment less than 24 hours from their appointment will forfeit their test fees. All registrations with accommodations must be rescheduled or canceled through the GED Testing Service Accommodations Team. This includes voicemails from students. Require the student to cancel the test and schedule it again.